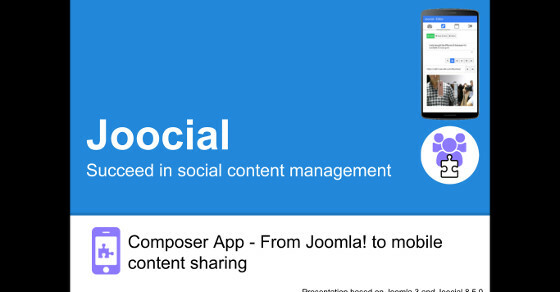 Composer App is a mobile app to manage your social content management from your Joomla! CMS site. Composer App is available for Android devices and Apple iOS devices. The installation has two steps: Joomla! configuration and Composer App installation. 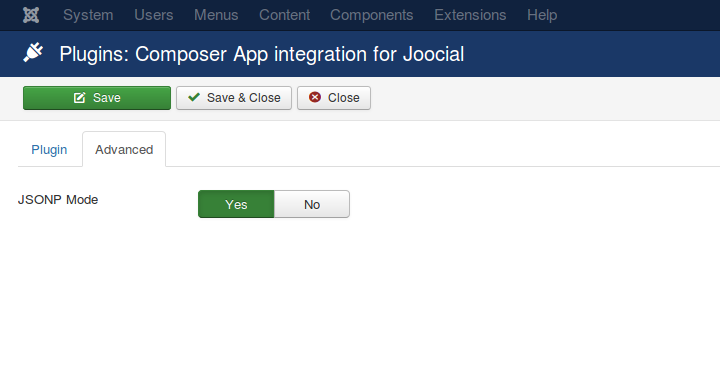 Composer App is a management application for Joomla! 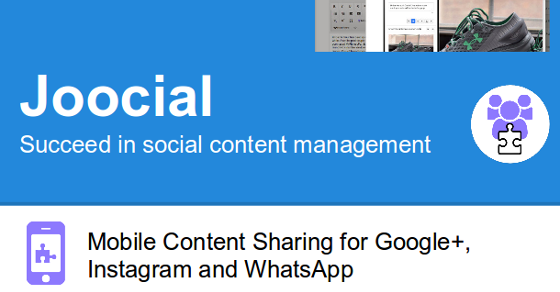 CMS, powered by Slim Apps. Management permissions are granted via a token access, generated with an OAuth authentication. 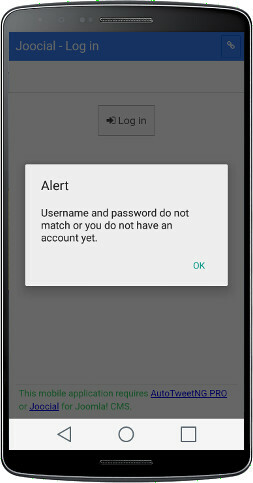 Username and password are NOT stored in the mobile app. OAuth credentials: These credentials must be entered in the plugin and in the mobile app to secure the communication channel. Please, assign Consumer Key and Consumer Secret in plugin configuration. Consumer Key only Consumer Secret are used to secure the channel. They do not grant permissions to access your Joomla! site. You can choose any sequence of alphanumeric characters. Test the integration with a simple string. For example: t3st. Do not enter special characters. Remember that you have to type them in your mobile! 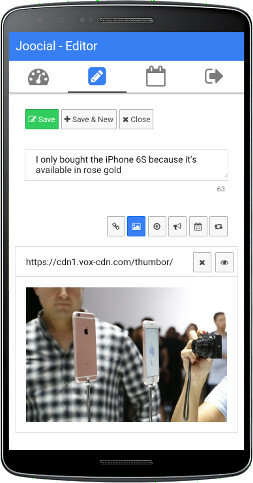 A mobile app, based on PhoneGap and Slim Apps, is a native client accessing your site. As a consequence, it is not limited by Cross-origin restrictions . On the other hand, your development browser is restricted as usual. Then, a solution for cross-development is desired. Slim Apps supports JSONP protocol to ease the development in a desktop setup and support all possible use cases. More about CORS: Joomla and Cross-Origin Resource Sharing (CORS) . This setting allows to enable JSONP mode for development. You have entered a wrong URL Domain. Please, fix the entered URL Domain. You have entered a wrong Consumer Key. Please, fix the entered Consumer Key. You have entered a wrong Consumer Secret. Please, fix the entered Consumer Secret. Your Joomla username or password are wrong. Please, access your Joomla site to verify your username and password, then try to access again. 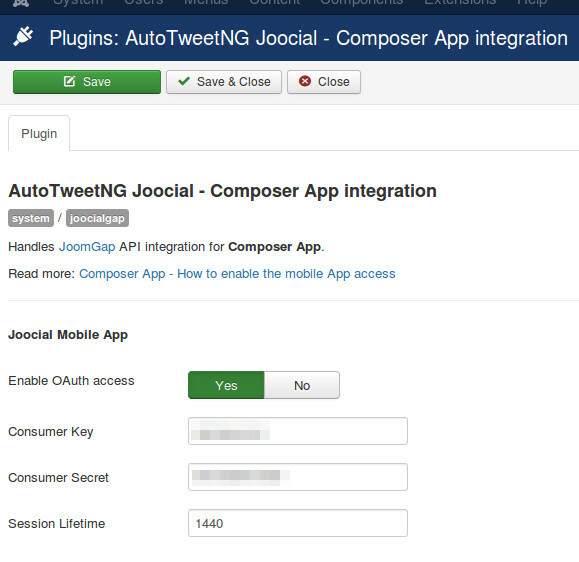 Only administrators users, with management permissions, can access Joocial Composer App. Access the App with an administrator user.